Many people use waterless alcohol hand sanitizers on a daily basis in place of hand washing with soap and water. Hand sanitizers provide a convenience factor, because they can be purchased in small bottles, they can be used on the go, and they require less time than hand washing. The question remains, though; are waterless alcohol hand sanitizers as effective as hand washing with soap and water? Alcohol hand sanitizers generally use ethanol, isopropanol, or a combination of the two. The alcohol functions to denature the proteins of the microorganisms, thereby quickly and effectively killing bacteria and many viruses. Hand sanitizers work by stripping the outer layer of oil on the skin, destroying any transient microorganisms that are present on the surface of the hands. The re-growth of bacteria on the skin tends to occur slowly, as residual bacteria emerge from the deeper layers of the skin. Proteins and fats on soiled hands will decrease the effectiveness of hand sanitizers, and extremely high concentrations of alcohol (most hand sanitizers ranging from 60 - 95%) tend to be less potent, because proteins do not denature as easily with a lower concentration of water (Simonne, 2008). Also, alcohol-based sanitizers should not be used when hands are visibly soiled, because hand sanitizers will not loosen and remove soil as soap and water does (Hand Hygiene, 2003). Plain soap, on the other hand, works primarily through the mechanical removal of transient microorganisms. It loosens and removes soil from the skin, and in doing so reduces the presence of germs that cause infectious diseases. Antimicrobial soaps also often contain an antiseptic agent to help lower the number of microbes (Simonne, 2008). A major factor in hand sanitizer effectiveness is under what conditions the hand sanitizer is being used. For example, the types of pathogens transmitted by hands in a health-care setting are different than those transmitted in a food-services setting. For the example of use in health-care, the Center for Disease Control and Prevention (CDC) released a study showing that hand sanitizers were an effective alternative to hand washing. This does not mean, though, that hand sanitizers are an effective alternative to soap and water in food-services (Hand Hygiene, 2003). This is due to reasons that are specific to each different user. A health-care worker must wash his or her hands in between contact with each patient to prevent the spread of diseases around the hospital. 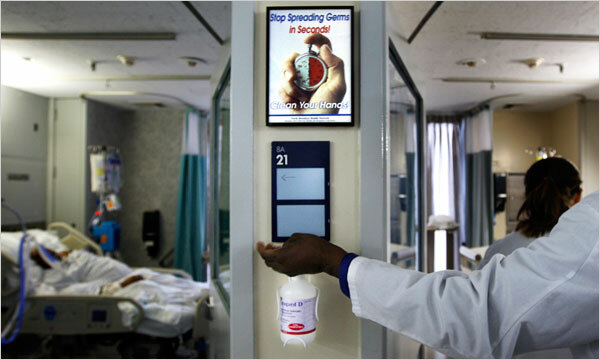 Hand sanitizers can help prevent the spread of diseases due to the frequency of use in the health-care setting. This is because alcohol hand sanitizers provide an excellent initial log reduction (reduction by a factor of 10) of gram-positive and gram-negative bacteria, fungi, and multiresistant pathogens such as vancomycin-resistant Enterococcus (VRE) and methicillin-resistant Staphylococcus aureus (MRSA). However, hand sanitizers do not have the ability to inhibit these microorganisms over the entire work day, and they have poor effectiveness against bacterial spores, protozoan oocysts (a thick-walled spore phase of some protists), and certain nonenveloped viruses. But since health-care workers must sanitize their hands frequently, the initial reduction of microorganisms provided by hand sanitizers is effective enough to prevent the spread of diseases. Hand sanitizers are also an effective alternative to soap and water due to the convenience factor that leads to increased compliance in hand sanitizing (Kovach, 2003). Studies have shown that health-care workers are more likely to sanitize their hands in between patients with hand sanitizers than with soap and water, because hand sanitizers require less time and are just as effective as hand washing under the given conditions. One of the reasons that waterless alcohol hand sanitizers are not effective in a food-services setting is their ineffectiveness against spores, which hand washing with soap and water will remove. If hand sanitizers are used, these spores can be translocated to the food products that are being prepared and served, and they could potentially find conditions in which they could become active within a host, or in the case of food-services, a customer. This could lead to the spread of pathogenic microorganisms through food products, and so, hand washing with soap and water is a much more effective method for the prevention of the spread of diseases. Other reasons for the use of hand washing instead of using hand sanitizer is that the alcohol products used in hand sanitizers must be approved as food additives by the FDA, and food-services workers often have wet hands and hands contaminated with proteinaceous material. Research questions the effectiveness of waterless alcohol hand sanitizers on wet hands and proteinaceous material. Another factor to consider when using hand sanitizers is the alcohol concentration. An alcohol concentration of no less than 60% should be used (Duda, 2007). An experiment tested the effectiveness of hospital-grade antibacterial soaps and a 40% ethanol hand sanitizer purchased at a retail store making the label claim of reducing “germs and harmful bacteria” by 99%. The experimenter washed his hands with soap for different lengths of time and with different techniques, and his hands were pressed against nutrient agar plates after each sanitation. The plates were incubated, and the results showed a large number of bacteria in the handprint impressed on agar plates after using the hand sanitizer, which was not seen by any of the other cleansing products. In a follow-up experiment, alcohol hand sanitizers with concentrations of 40% and 62% were tested, and the hand sanitizer with an alcohol concentration of 62% showed to be significantly more effective in reducing bacteria than the 40% alcohol hand sanitizer (Scott et al, 2006). This difference could be due to alcohol’s ineffectiveness against spores. If all of the bacteria present on the hands produce spores, and the spores are neither removed by the hand sanitizer or flowing water (as soap and water would remove them), they will remain on the surface of the fingers and will be translocated to the nutrient agar where they can begin growing under suitable conditions that support growth. Though these results are what should be expected, they also show that if a consumer wants to use an effective waterless alcohol hand sanitizer, the alcohol concentration should be no less than 60% to effectively sanitize one’s hands. In conclusion, waterless alcohol hand sanitizers can be an effective alternative to hand washing with soap and water under certain conditions. The first condition is that hands must not be visibly soiled. Another condition is that the hand sanitizer is used in an appropriate environment. Though they are effective in the health-care setting, hand sanitizers should not be used in food-services, because they do not prevent the transmission of diseases through the food products that are being handled due to their ineffectiveness against spores and their ineffectiveness when hands are wet or contaminated with proteinaceous material. Lastly, hand sanitizers should have an alcohol concentration of 60% or greater in order to effectively reduce microbial presence. Although hand washing with soap and water is still the tried-and-true method of hand sanitation, waterless alcohol hand sanitizers can be as effective at hand sanitation as long as these factors are taken into account. Duda, Kristina. 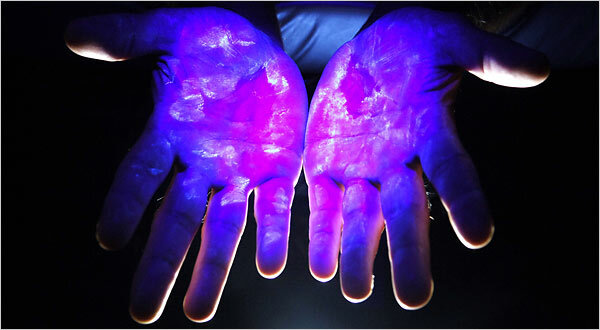 “Is Hand Sanitizer Better Than Washing?” About.com: Cold and Flu. June 22, 2007. Health on the Net Foundations. November 28, 2008. .
“Hand Hygiene in Retail & Food Service Establishments.” Food Service Safety Facts. May, 2003. U.S. Department of Health and Human Services. November 29, 2008. <>. Kovach, Thomas. “Choosing an Alcohol Hand Sanitizer.” Infection Control Today Magazine. November 1, 2003. Virgo Publishing, LLC. November 29, 2008. <>. Reynolds, Scott A; Levy, Foster; Walker, Elaine S. “Hand Sanitizer Alert.” Tenessee State University. November 3, 2006. Center for Disease Control and Prevention. November 29, 2008. <>. Simonne, Amy. “Hand Hygiene and Hand Sanitizers.” University of Florida IFAS Extension. 2008. University of Florida. November 28, 2008. <>. Great information. Great site. Really enjoyed reading the tips. Keep up the good work. I am very thankful to all your team for sharing such amazing information. It really helpful for us. It quiet useful sharing, thanks for it.